Quite simply one of the most recognisable styles in the history of sunglasses, the Ray-Ban Wayfarer continues to retain an iconic and timeless look which is recognised wherever it is worn. The Wayfarer is in a class of its own. Keeping the iconic Ray-Ban shape, it’s made of premium acetate with a unique pattern and design. 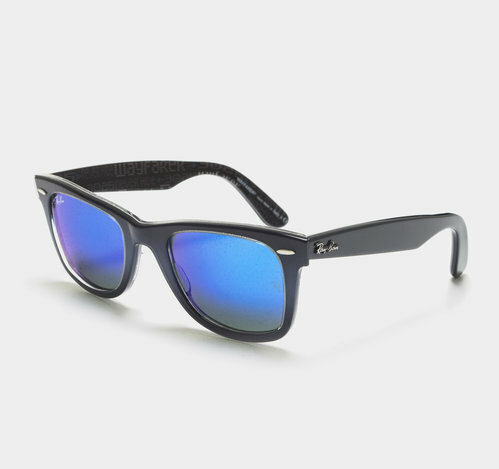 Complete with a polarized lenses, this eliminates distracting light reaching your eyes and means a drastic reduction in the brightness and glare from shiny surfaces. Offering 100% UV protection, these Ray-Ban sunglasses come complete with their own stylish carrying case so you can be prepared for any occasion, indoors or outdoors. The Wayfarer also features distinctive 3D rivets, complementing the look and feel of the exclusive material it’s made of. Get ready for red-carpet treatment.